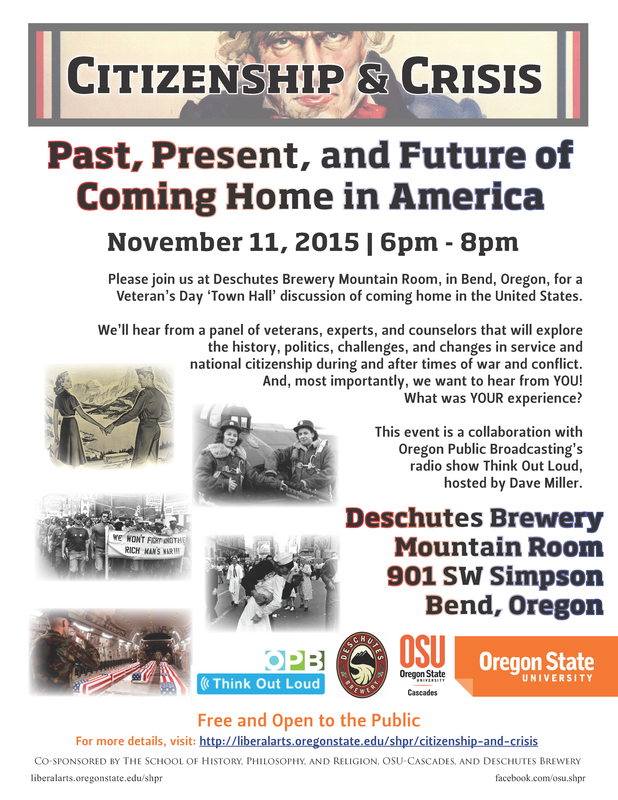 6pm-8pm, November 11, 2015, an OSU-OPB town hall on Veteran’s Day at the Deschutes Brewery Mountain Room (901 SW Simpson St. Bend, OR) *a collaboration of OSU, as part of the Citizenship and Crisis Initiative, with OPB’s Think Out Loud, hosted by Dave Miller. The format is to have panel discussion with audience participation. This event was shaped by scholars, teachers, staff, and students at OSU. It is not a “media” event and there is no political agenda. We are just sharing information and perspectives. There will be free food and a cash bar. 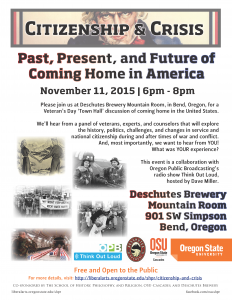 The event will be audio taped and edited to air on OPB radio on Think Out Loud at noon on November 12. We plan to have scholars, veterans, counselors, activists, and others involved, and this is likely to be covered by the media as well. We did one of these OSU-OPB collaborative town halls in Corvallis in February and it reached tens of thousands via radio and had a terrific audience and impact. The veteran community down at UC Berkeley would like to offer our student veterans and veteran alumni the opportunity to join them in their veterans appreciation game as the Beavers take on the Bears down there on the 14th. If you are interested in getting tickets please email veteranresources@oregonstate.edu by November 10th and let me know how many tickets you would like so I can get them a total.